In 1904 (Oct. 17-22) the American Library Association held its annual conference in conjunction with the World’s Fair (Louisiana Purchase Exposition) in St. Louis, MO. George Eberhart, Senior Editor of American Libraries’ AL Direct, wrote a wonderful article about the 1904 St. Louis conference for the CentenniAL Blog which celebrated the centennial of American Libraries. Most of the attendees of the conference stayed at the Inside Inn which was the only hotel located inside the fair grounds. I was recently able to obtain a postcard of the Inside Inn (shown above), a postcard which I have coveted for some time. The postcard is special because it is a "hold to light" card. When you hold it up to a light the windows of the hotel glow. The postcard was actually mailed from the Exposition Station of the Post Office during the fair. I previously wrote about the Inside Inn in a blog post on July 7, 2011. 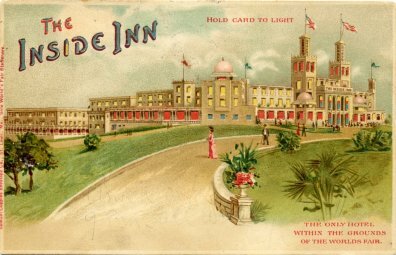 Rates for staying at the Inside Inn started at $1.50 per day European plan and $3.00 per day American plan including admission to the fair. According to Eberhart, there were 26 former and future ALA presidents in attendance at the conference including Melvil Dewey, Herbert Putnam, and Gratia A. Countryman. The conference meetings took place at the fair’s Hall of Congresses, a building which exists today as Ridgley Hall of Washington University. 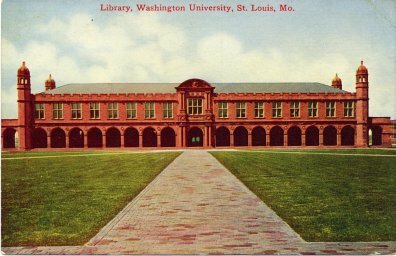 Ridgley Hall housed the University Library until the 1960s (see postcard below).